There's a new way of shooting in FIFA 19. It's called Timed Finishing, and use it right and you'll find the back of the net almost every time. It can be tricky to pull off though, especially while under pressure, but worry not! We've got you covered. In this FIFA 19 Timed Finishing Guide, we''ll detail exactly how Timed Finishing works, and also take a look at how to time it perfectly. If you’re looking for anything else FIFA 19 related, be sure to head on over to our FIFA 19 Guides Hub. It’s got info on how to score lots of goals in FIFA 19, a look at the very best players in the game, and plenty more. 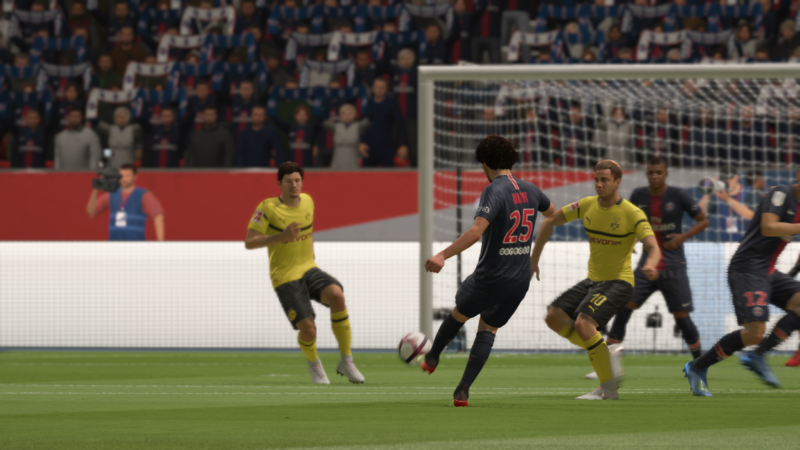 To make the most of Timed Finishing in FIFA 19, you need to get your timing just right. The timing is different for every player, and getting things wrong can really mess things up for you, so practice is vital. To help you get started we've listed some vital info below, so be sure to study up. Your player will take a regular shot, unless you tap shoot a second time, after which Timed Finishing will be active. If you choose to go this route, you’ll need to hit shoot for the second time as the ball makes contact with your player. Depending on how accurate you were, there will be a color outline to your player icon. Timed Finishing in FIFA 19 essentially adds an extra layer of finesse to your shot. You’ll get more power, and accuracy, though it only builds on the shot that you took initially. Because of this, good shooters will already take great shots, with an extra bit of power. If the player your finishing with isn’t a great shot to begin with, then you won’t magically become amazing by landing a perfect Timed Finish. It’s worth reiterating that you don’t have to use the Timed Finishing at all, and can just take normal shots if you please. So you've spent hours getting the timing down for one of your favorite strikers in the practice arena, you should be all good to go, right? Well, not exactly. You see, every player in FIFA 19 will have a slightly different window for Timed Finishing. This is dependant on their size, stature and shooting motion. While Timed Finishing can definitely make the difference between a goal and a miss in some cases, it is not suited to every scenario. You're best saving Timed Finishes to long-ranged shots from outside the box. If you've got time to kill as a cross comes in, adding Timed Finishing to a volley can be great as well. It is not recommended for high-pressure situations, as more often than not, you'll end up fluffing it.